Waking up at Everglades Holiday Park in western Broward county we were treated to a pleasant and sunny morning on the expedition’s second day. Though this was in February, there were quite a few bugs around. Truth is the winters in South Florida have been rather warm lately, and it’s been pretty “bad” bug-wise in the Everglades! Water levels were also high, which didn’t help. Unlike the dry “parking lot” type campground by Lake Okeechobee on our pre-camp night, there was a lot of morning dew at Holiday Park and everything was wet! There are bad bugs ..
Ready to take on the sun and any bugs!! Holiday Park was chosen as a campsite for it’s location on an Everglades canal and also because it is in an intermediate zone, between wilderness and the urban world of people. It’s a kind of place that “wants to be wild”, but has been disturbed and left to itself for the most part. It’s a place where invasive and exotic species can often overtake and out compete native indigenous species. This made it an ideal place for the team to talk about the (artificial) human induced pressures and stresses on the Everglades ecosystem during our morning webcast from the L-67A levee. Naturalist Victor Suarez talks about the native vegetation of South Florida. Expedition team webcasting live from the L-67A levee at Everglades Holiday Park. Day II: Canal paddling on the L-67A , intersecting with the Miami Canal to the edge of civilization. Tourist airboats greet the new day at Holiday Park on the L67A canal. Everglades Holiday Park is a popular place for (mostly motorized) recreation in Water Conservation Area 3. Holiday Park circa 1954 along the same stretch of the L67A canal. On this segment, the team would be paddling entirely within the Water Conservation Area 3B (WCA 3B) in far western Broward county. The Water Conservation Area is ringed and crisscrossed with canals and levees, but it still functions as a part of the northern Everglades. However, it is a wholly artificial system that was designed to primarily store excess water from Lake Okeechobee and to provide flood protection for the developed sections of South Florida. Team canoeing down the L67A canal in Water Conservation Area 3B. WCA 3B is the smaller part of two in Water Conservation Area 3, the other being WCA 3A. 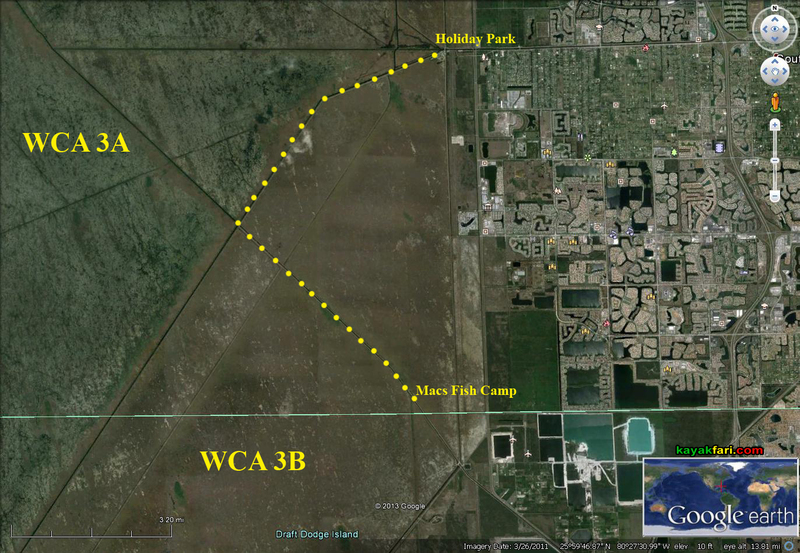 Currently as part of Everglades restoration efforts, WCA 3 is undergoing decompartmentalization studies between the two parts. Some big changes will eventually take place to restore sheet water flow across the entire conservation area along this very stretch of the canal that we were paddling on. This will help to mimic the historic natural cycle(s) and provide much needed water to the Shark River Slough once sections of the Tamiami Trail (Hwy 41) are elevated to allow for the flow! A seemingly endless canal, in this case the L67A, cuts through Water Conservation Area 3. If you stay in this canal you’ll eventually end up on the Tamiami Trail. Thick vegetation lines both sides of the canal. Even though the levee here is less than 20 feet away, it would be tough to get out! The L-67A canal runs due southwest for about 25 more miles where it intersects the Tamiami Trail (and canal). From there it is possible to transition to the L-67 Extension canal and continue paddling down the Shark River Slough – THE “River of Grass”! Expedition team paddling towards the intersect of L67A and the Miami Canal in WCA-3B. After 5.5 miles of canal paddling we reached the intersection of the Miami River Canal at last – just in time for lunch and our afternoon webcast! Our industrious team sets up a temporary shaded base of operations on the levee. Shade is really a precious commodity in the flatness of the Everglades! Even in February, the South Florida sun burns hot. The S-151 structure on the Miami Canal in WCA 3B. A young gator chilling in the Miami Canal. High flying vultures ride the thermals all day long looking for any food scraps. Expedition team webcasting live from the Miami River Canal in WCA 3B. Measuring water clarity in the canal with a Secchi disk. Chris and Janet measure canal water quality for the webcast. Underwater view from the Miami Canal. Note the limestone rock, which continues to be quarried in quantity elsewhere along these canals. Phosphorus is the main “pollutant” in the Everglades. It’s a fertilizer so it actually promotes plant growth. As water drains down through the Everglades Agricultural Area from Lake Okeechobee it picks up fertilizer and chemical runoff draining from the mono-culture farm fields and surrounding developed areas. Later, elsewhere in the Everglades, this phosphorus laden water then similarly promotes the “mono-culture” growth of only certain species like cattails and algae. This really upsets the historic normal balance in the Everglades and reduces the biodiversity of the classically low nutrient level Everglades environment. Since the Water Conservation Areas are essentially giant retention ponds, this polluted water then continues further down the Everglades, released and regulated by the SFWMD. Eventually the water drains into Florida Bay and the Gulf of Mexico where abnormally high phosphorus levels can then lead to problems such as algal blooms and fish kills. Drainage canal in west Miami circa 1910. Susan Sylvester webcasting from the Miami Canal in 2014. Dredge working the Miami River Canal in 1926. The canals have segmented the vast Water Conservation Areas into distinct units for water storage and storm runoff. Super telephoto view of power lines and rock quarry silos that are 10-20 miles in the distance along Water Conservation Area 3B. Paddling down the Miami Canal in Water Conservation Area 3B. Expedition team paddler Hope Hitchcock. On this stretch of the Miami Canal, there was quite a bit of birdlife, such as these beautiful Roseate Spoonbills. There were also lots of Ibis, Anhigas and Wood Storks like this one. Another 5 miles of canal paddling brought us to Mack’s Fish Camp. Mack’s Fish Camp is a small oasis on the edge of a sea of suburban sprawl just a few miles from Hwy 27 and Krome Avenue. It has a real old time feel to it, and we were happy to camp on the grassy canal bank. It’s quiet, save for distant noises from airplanes en route to Miami International Airport. Arrival at Mack’s Fish Camp on the Miami Canal which is on the very edge of the “Everglades” in WCA 3B. A similar Everglades canal in 1921, about the same time that fishing camps were springing up along these canals. Mack’s Fish Camp is well worth a visit and offers lots of character. Originally a squatter’s camp, Mack’s is the last one left and is family owned for generations. River of Grass 2014 Canoe Expedition on the Miami Canal at Mack’s Fish Camp. Mack’s Fish Camp is family owned and carries on the Gladesmen tradition of many decades. The camp has a zip code and streets, and is just about on the Broward and Miami-Dade county line. While Mack’s might seem an oddity in today’s South Florida, it reminds us that not so long ago many people used to live like this. Miami was a frontier town and life on the edge of the Everglades meant living off the land! The road to Macks Fish Camp. “Welcome to the Jungle” at Mack’s Fish Camp in the Everglades. Moonrise over an airboat at Mack’s Fish Camp. Yup, Mack’s camp definitely has that Huckleberry Finn feel to it! Full moon over the Miami Canal at Mack’s Fish Camp on the edge of development in S. Florida. Storybook nightscape of Orion descending over our camp at Mack’s Fish Camp, Everglades. © 2014 Flex Maslan / kayakfari.com / digital029art.com. All original photographs, artworks and music in this portfolio are copyrighted and owned by the artist, Flex Maslan, unless otherwise noted. Any reproduction, modification, publication, transmission, transfer, or exploitation of any of the content, for personal or commercial use, whether in whole or in part, without written permission from the artist is strictly prohibited.